3-piece set includes 8-inch melamine plate, 5.5-inch melamine bowl, plus 9 oz plastic tumbler. Dishwasher safe (top rack). BPA free. Comes boxed. 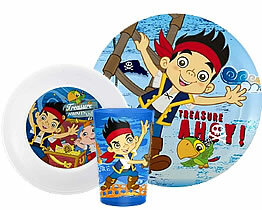 Great for pirate fans and fans of Jake and the Neverland Pirates.